DOCTOR WHO - Looking back at SILVER NEMESIS | Warped Factor - Words in the Key of Geek. Christopher Morley turns the clock back 26 years for a battle with the Silver Nemesis. 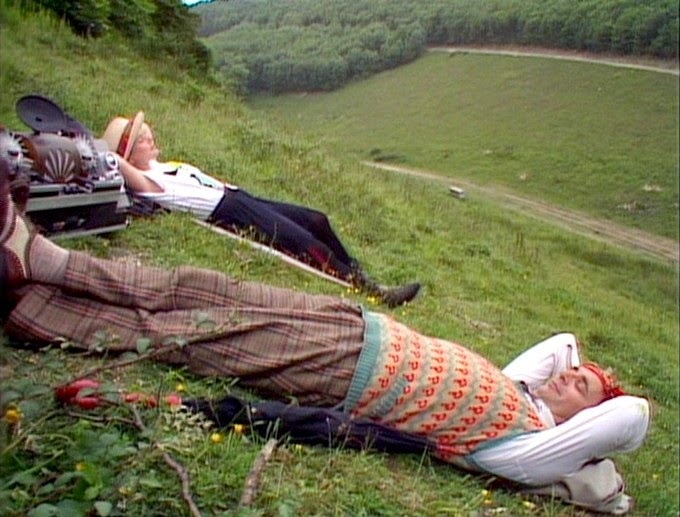 Somewhat fittingly, the twenty-fifth anniversary of Doctor Who fell during Season 25 in 1988- with the third story given over to marking the occasion. Anyone in the know on the subject will tell you that if you happen to have been wed to your good lady or chap for that length of time, its known as your silver anniversary........so Doctor Who did what only Doctor Who can in taking something seemingly normal & twisting it into something altogether more alien! The edict to use silver as a theme came from producer John Nathan-Turner, who decided he also wanted royalty involved- thus Windsor Castle ( or more accurately Arundel Castle standing in for its illustrious counterpart) came into play. Writer Kevin Clarke was keen to pose the question 'who is the Doctor? ', as the chap with the spoons was now beginning a transition from something of a clown into an altogether darker, more manipulative sort- a change which Ben Aaronovitch's Remembrance Of The Daleks would offer the first glimpses of as the maiden outing of the series, & indeed his novelization of his own story goes into even greater detail on certain points. ''My exact words were: 'I'd like to overthrow the government'. I was a young firebrand and I wanted to answer honestly. I was very angry about the social injustice in Britain under Thatcher and I'm delighted that came into the show." ...in response to a question from Nathan-Turner on what he'd like to achieve after being given the job. Against which backdrop Silver Nemesis becomes quite a knockabout romp by comparison! 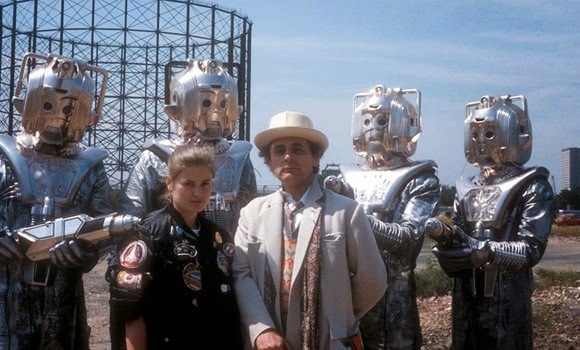 Four competing parties- the Doctor himself, De Flores & his gang of Neo-Nazi thugs, sixteenth century sorceress Lady Peinforte & a squadron of Cybermen- are after the Nemesis statue. And to think Ace is more interested in the football results ( ''Have you seen this? Charlton picked up three points.'') than a story about the return of the Nemesis- she & the Doctor seem to be having a nice enough time at a performance by jazzman Courtney Pine, who contributed three original compositions to the soundtrack- Pe Pi Po & Adrian's Affair can be heard in Part One, while Part Two features Frank's Quest, both these latter two pieces named after co-writers Adrian Reid & Frank Tontoh. 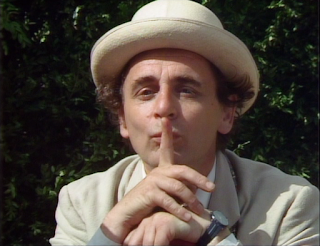 The Doctor loves it, outing himself as a jazz fan- ''This is my favourite kind of jazz, straight blowing.'' Pine even signs a cassette for Ms McShane ( younger readers might like to know that in a long-forgotten age music wasn't available solely on CD or download). The little Scot in the pullover's even been kind enough to make her a new tape player to replace the one blown up by the Daleks. This is no time to turn on, tune in, drop out, realise your cassette's been chewed, get a pencil & try desperately to salvage the spooling remains of the tape, though. Luckily this particular model does so much more than just play music- the Doctor's added a few other handy features, one of which enables him to work out that the Earth's in a spot of bother thanks to what's heading for "Landing Location, Windsor, Grid Ref: 74W 32N, November 23, 1988" according to De Flores's computer. ...a look he'll come to love once more five incarnations down the line. Somewhat ominously, Peinforte's managed to take herself & her manservant Richard into the Eighties with only a rudimentary knowledge of time travel, a little help from black magic doing the rest. Richard's a bit of a wuss, too, being terrified of llamas ( ''What creatures are these? They will eat us. I beg you, my lady, return us to our own time. The England now is full of terrors.'') There's a chessboard lying around back in her own time, too- a portent of what was to come in The Curse Of Fenric. ''Do you think I didn't know? The chess set in Lady Peinforte's study? I knew.''. Cyber-LEADER: This is most rational, Doctor. 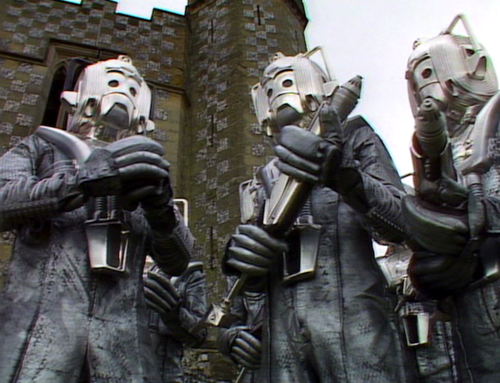 Cyber-LEADER: The secrets of the Time Lords mean nothing to us.